This is a dish that has been heavily inspired by Ranjani's recipe. I just made a couple of changes as I went along. Here's my version of it. Heat oil in a large pan. Temper it with the ingredients listed above. Add the ginger and garlic followed by the chopped onions. Sauté till the onions are done. Add the ketchup, tomato paste, and coriander and chilli powders. Mix well and cook, 3-5 minutes. Next, add the mashed potatoes along with 1-1 ½ cups of water depending on the consistency desired. Cover and cook till the gravy thickens, 10-12 minutes. Serve hot with rice or rotis. 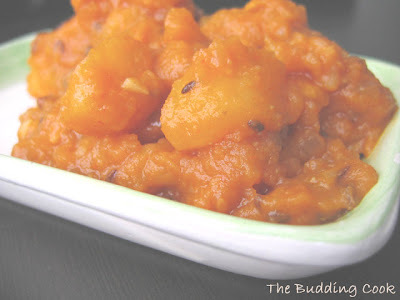 We had this with some dal-rice and absolutely loved it. I will definitely be making this again and again! It was tasty, spicy, tangy and more! Thank you for sharing a fantastic recipe, Ranjani. Off this goes to Sunshinemom for Food in Colours: Red. Love potatoes in any form. The colour of the sabzi is very rich.looks yummy. That sounds so tomatoey and tangy - very quick too. What luscious-looking potatoes, TBC. There's a similar Konkani version with tamarind that I sometimes make. My fiend makes something like this and calls it station aloo. To be served with pooris. Looks too good. mmm..the aloo gravy looks so tasty. Mmm..aloo ki subzi looks so so yummy!! Coariander, chilli and cumin sounds like a winner 3C to me. Looks like a great way to enjoy potatoes! Homecooked- I do too. :D thanks. Hope the connection issues are resolved soon.